"MILWAUKEE" KEYED CHUCK 1/2'' HAMMER DRILL KIT For percussion drilling with carbide-tipped hammer-drill bits in concrete and masonry or drilling without hammering in wood or metal. All ball and roller bearings Side handle can be used on either side and with or without depth gauge. Trigger speed control. Self-stopping brushes. Soft grip handle. 8.5 Amp motor. Heavy duty metal gear case for rugged durability. Quik-Lok Cord - Quick detachment from tool for tangle free carrying and storage - Instant field repair. Flat Boring Bits: 1-1/2 / 3/4" Hole Saw: 3-3/4" Auger Bits: 1-1/4" Ship Auger Bits: 1-1/4" Selfeed Bits: 1-3/4" Twist Drill: 1/2" / 1/4" Hammer in Concrete: 3/4" Volts AC: 120 No Load RPM: 0-1,000/2,500 No Load Blows per Minute: 0-16,000/0-40,000 Length: 13"
The item was as promised. It was just as it was described new. It was shipped as promised, right away. It works excellent, have used it often. It has been my experience with customer reviews that often they are posted too early and do not offer enough detail to be useful. Because of this I have waited for 6 months to post a review. The Milwaukee 5387 hammer drill has been simply awesome. I am a professional voice/data cabling installer and have used this drill on job sites frequently and have been totally pleased with the quality and power of this drill. The fit, finish, and feel of this drill is first class. The casing has been very durable thus far with no cracking issues or the rubber on the backside of the grip peeling off. This drill is on the heavy side and mainly towards the front - and can get tiring if holding it over your head for long periods of time.. However, I am gladly willing to trade a little extra weight for a tool this solid. 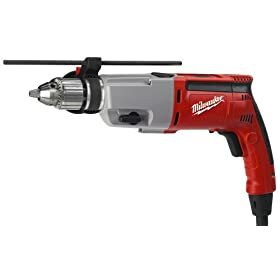 I have used this drill to beat 1" holes through concrete/spancrete, cinder block, and brick without any problems with heat or the motor bogging down. As others have said this thing is VERY powerful - it has snapped my wrists around a few times when the bit has bound up. The chuck in this drill has been very reliable thus far - out of the box it was true and after 6 months of use I still have had no problems with it bending or warping or the jaws not holding the bits securely. The detachable power cable is a wonderful feature - it is the same design found on other higher-end Milwaukee tools. The cord is a nice heavy yet flexible rubber, and long enough to be useful. I have not had any problems with the rubber on the ends of the cable wearing, cracking, or peeling. I would definitely recommend this drill to any professional or anyone who demands a reliable drill that will last a very long time! 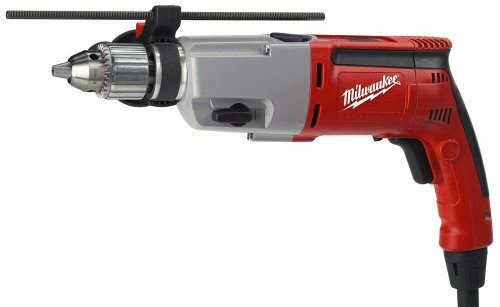 My first Milwaukee tool was the 6740-20 drywall gun. I was so thrilled with it, that my next drill had to be Milwaukee. I was pleasantly surprised at what a relatively large and heavy machine the 5387-22 is. For the professional or serious do-it-youselfer, this is probably the only heavy-duty drill you'll need, and probably the last one you'll ever have to buy. Keep your cordless drill for your light-duty work, and bring this baby out for your heavy-duty jobs. Fair warning, this drill is heavy and will cause fatique within a relatively short time. But this bad-boy will handle just about anything you throw at it. I'm sold--it's Milwaukee tools for me from now on! Great drill. The hammer drill feature is amazing. It has enough torque to get just about any job done. I would give it 5 stars, but the variable speed trigger is EXTREMELY sensitive. This makes it hard to use as a mixer for drywall, cement, stucco, etc. it also puts a great strain on the motor to use it for this purpose. I have installed shower doors for about 9 years and used this bad boy on a jobsite when my Makita hammer drill just wasn't getting the job done. I bought one the next day and have been using it ever since. Drilling concrete is easy drill through 1 1/8" thick granite, thats a chore. But this thing blew right through it. I highly recommend this tool. This is one of those drills your great grand children will be using 50 years from now saying they don't make em like they used to. I really hate morons who quote commercials but I could not resist! This darn thing flies through concrete. I mean flies. I am not a contractor or professional. And you can break a wrist if not careful due to the extreme power. But if you want to get 'er dun, like installing awnings, this honey will save you a coronary! The Milwaukee 8.5A Hammer Drill is a great tool. It has the power needed for heavy duty drilling in concrete and it, like the entire Milwaukee line of power tools, is the highest quality. If you need tools that can take a beating and survive then I recommend the Milwaukee heavy duty line up. This drill is the best value for the money. Pay a bit more for a product that is made in Germany, not some third world country. Milwaukee's 5387-22 is a large, powerful piece of equipment. It was created to puch holes in masonry, but it is so smoth, you could use it for many other jobs. The drill is manufactured in Germany and the quality shows. Another reviewer mentioned the trigger is too sensitive, but mine seems fine. The only caution I would mention is the balance of the drill. It is long and has a front-end wight bias. You will not be using this drill one-handed. The weight is not bad, but the length and forward location of the weight will cause you to need the side handle. This is actually good, because the torque of this baby would rip it out of your hand if a bit sticks in your work-piece. The side handle will help you keep it under control. If you need a general drill, this is too much. If you need a STRONG drill that will probably last longer than your lifetime, this is it. Milwaukee makes a number of GREAT drills, and this unit is certainly one of them. Be sure not to confuse this with another similar model: 5378-22. That drill is not nearly as good as this one. Just be sure to hold on with both hands. Once you use it, you'll know why. I recently purchased this Milwaukee hammer drill to replace a similar-sized Bosch that had quit working. Nothing against the Bosch--it did the job and Bosch replaced a broken switch under a warranty that I thought was long since expired--good customer service. However, the Milwaukee will be the one I reach for first--more comfortable, better balance and more power at the tip of the bit. It has done everything I've asked it to do and done so with ease, including masonry and steel drilling. It is a well made tool that should last for a long, long time. This is a medium-duty tool. If you need big holes in brick or concrete or need to break up concrete, etc., get one of the larger rotary hammers. I use this drill for small to medium-sized holes in brick, masonry and concrete as well as drilling up to 1/2" holes through 1/4" steel. I almost want to say "medium duty" but that implies this is a lightweight, and it toys with Milwaukee's Heavy Duty slogan. For me, however, this falls between the V28 hammer drill that I use for most small tasks and the 5342-21 Rotary Hammer that I use to drill through fieldstone, thus it fits a niche between the other tools. It is an excellent tool, and for most users it will be the most powerful drill they need. Although I am somewhat disappointed in it, most of that fault lies with my intended use exceeding its capabilities. Although I'm sure it is great for brick and masonry and maybe even concrete, it handles longer holes clear through fieldstone and river rock with a bit of difficulty. A good part of the fault lies in the availability of bits that don't fall apart (most brands didn't survive more than an inch or so of cutting; to be fair, I didn't try Milwaukee or Hitachi brand bits; Irwin seemed to work the best). The only reason I'm taking any stars off whatsoever, is that the chuck seemed to loosen up on me with most of the 1/2" bits I tried. It had no problem hanging on to the smaller bits I used for pilot holes, but it let go of quite a few other bits. With the Irwin bits, you can fit the 1/2" ones into the teeth of the chuck in a certain way and they will hold beautifully, but if you put them in off of that ideal axis or if you have a round 1/2" bit, it tends to slip, and that's not a good thing. Although I had to step up to the rotary hammer to meet my needs, I still expect to get use from this drill in more suitable mediums ~ wood decks and fencing, especially, and perhaps some brick or so forth.